I’ve always wanted to read some Joan Didion. Her name seemed to come up often in intellectual circles as this high standard for women writers. Me being me, I wanted to know what all the fuss was about. Every ounce of praise for Didion’s writing is deserved. I picked up a battered copy of The Year of Magical Thinking at my local library on a whim. It was there. I had the inclination to read. This is how literary love affairs start. 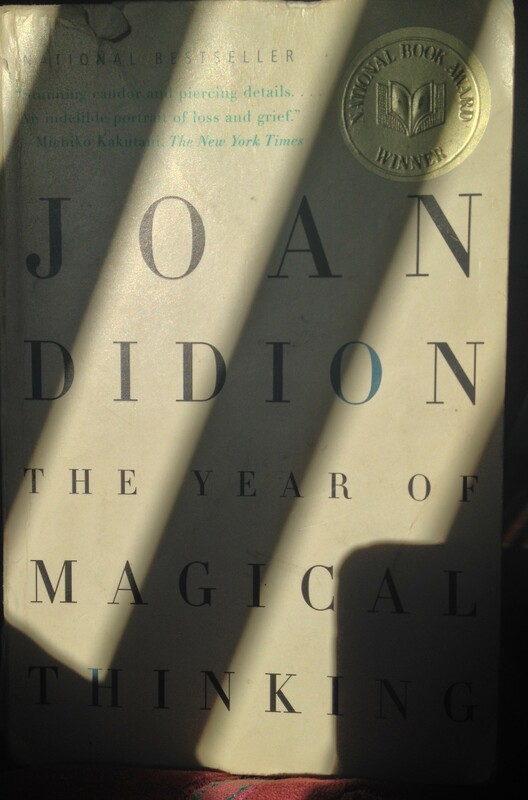 The Year of Magical Thinking is a memoir told in a reconstructed stream of consciousness about the emotional trials Didion faced in the year after her husband, author John Dunne, died suddenly at the dinner table. Throughout the year Didion also finds herself facing the potential of her daughter’s death through illness and the slow dissolution of her denial. Heavy stuff. Yet without knowing it, I picked up the Didion book that I most needed to read. Need is such a funny thing in the context of grief, because “need” loses all logic. Didion expertly explores this chasm, this limbo where the living must continue on when a loved one has passed. I needed to read this book because in January of 2013, my father died, and I have spent so much time closing myself off to that reality. I was set to board a plane for Sundance for a class when I was woken by a banging on my door at 4 AM. It was my great-uncle, who told me that I needed to call my Grandmother. My father has been admitted to the hospital a few days before, his fever and pain likely symptomatic of his kidney stones. He was also a type two diabetic with kidney failure, but he had texted me to tell me that he was 100% OK and not to worry. He said today was not THE day. But when someone tells you to call family at four in the morning, the news is never good. I knew before my grandmother picked up what she would say but the news of my father’s death still felt like a ripping. He had a stroke, suddenly in the night, after being told the previous day that he was making a strong recovery. In crisis, sometimes you know exactly how many minutes you have before you fall apart. I knew I had five. I used those five minutes to call my professor and my boss to tell them I would not be making it to Sundance. Then I curled up in a ball on my tile floor and screamed and cried. Didion points out that we often use the word “suddenly” when talking about death. Her husband suddenly died at the dinner table. My father suddenly had a stroke. She quite honestly, if brutally, points out that there is often nothing sudden about these sorts of events. Her husband has known about his heart problems for twenty-plus years. My father had been a diabetic since he was eighteen, and his kidneys had begun to fail when I was in high school. The use of “suddenly” is a blanket we, the survivors, wrap around ourselves because we wanted to believe all was well. Over the years, I’ve learned that my preferred method with grief of any kind is a cultivated numbness. A bottling away of pain and a good, quiet presentation of a happy face. Reading The Year of Magical Thinking and writing this post have been breakthroughs of sorts into that cultivated numbness. It has been roughly a year and half. I am still grieving. And that is OK.
My father wasn’t perfect, nor was our relationship, but perfection has no place in death. In the past year and a half I have often felt haunted by my father. Not in the literal ghost sense, but in the sense of echoing memories. Every comic book movie, every mention of military history, every surviving trinket holds more weight because these were things he loved and his love of these things was passed on to me. Things and places haunt us as readily as the idea of people. Joan Didion’s prose is in itself haunting and flows effortlessly from the factual to the poetic. This is a woman who has taken comfort in research and knowledge: she writes from the intersection where information ceases to be a balm and grief demands its due. She is often startled by objects and their inherent meaning. Woven throughout each memory and interaction is the familiar, surreal desire that perhaps John will return. As if he were merely lost instead of a loss. Didion’s use of repetition carries an ethereal element and a sense of numbness that resonated with me. Lines of verse intermingle with memories and medical definitions that give the memoir a dream-like quality. Here was someone that understood. There are certain books that should be doled out at various moments in a person’s life. Because some books need to be read. For me, I believe girls should be issued a copy of He’s Just Not That Into You by Greg Behrendt when they hit junior high (gentlemen, you’ll have to let me know if there is a male equivalent). And now I believe The Year of Magical Thinking ought to be delivered, wrapped in plain brown paper, when a loved one has died with instructions not to read it until at least a year has passed. Because sometimes you need that year to be in denial, to grieve, to mourn, or whatever it is that you do in order to gain perspective. Any one punctured by grief will find a kind of catharsis or at least a kindred spirit in Didion. As you read it your own grief, your own stories will well up so that The Year of Magical Thinking becomes as much your story as it is Didion’s. To me, that’s the truly magical part of this piece. It’s a short book at 227 pages, but it took me about two weeks to finish because I often needed to put it down and walk away. This book will hurt. But it helps. I would highly recommend The Year of Magical Thinking to anyone who has struggled with loss. I give it 3.5 book bubbles. Glad I saw this post. Thank you. I’m glad you could connect with it. Didion is great writer. I have only read a few of her things. She has a way of planing one single idea in your head that never goes away. In her book Miami, in which she discusses the world of Hispanic culture and crime in that amazing city. She wrote …” behind every great fortune is a crime” You can look around you and see how true that is. I’m looking forward to reading more Didion in the future. She has a way with language that is apparent from the first line. It’s always good to find an author that inspires and allows their ideas to cultivate in our own minds. I’ll keep Miami on the short list, thanks for the recommendation! Read it a year or so ago. For me, I think it’s a book that I can read once and have it linger in the best way possible. I may not re-read it but who knows? Thanks for commenting! Thank you so much, Anne-Marie! Books that you can read yourself in become more profound that way and I think that’s the hallmark of a good author. Didion certainly fits that bill. You use beautiful combinations of words. Thank you very much! I’m glad you enjoyed this piece. It was a hard one to write but it feels amazing to be sharing it with readers. I am adding this to my reading list. Hopefully my library has a copy as well! Although at your recommendation, I may just buy it and save it for someone else’s rainy year. Death is a struggle we all come into contact with and it is never easy (as anyone who has had the misfortune to experience will tell you). Beautiful writing. Thank you for sharing your story. Thank you very much. Everyone has to face death in some capacity sooner or later and its never really easy. I don’t think you ever really get over the loss of a loved one, you just get better at handling it. If you end up reading this book yourself, you’ll have to tell me what you think! I will definitely have to pick up this book; I still struggle on some days with my mom’s passing. It seems like something that you just never get over. I’m sorry to hear of your loss. And thank you for your kind words. Every day is a small struggle with grief, but there are also great moments in it too where you remember something good that that person said or did. Those moments are just as special, and I think Didion’s book covers that too. I hope this book helps you, but it might be a hard read! Thank you very much! I appreciate you reading it! A beautiful expression. Your review is inspiring and so well written! I’m sorry to hear about your husband. We’re each given a family by birth but losing the family you choose is just as hard. I hope this book helps in some small way, though it will definitely be a tough read if your experience with it is anything like mine. I wish you all the best and thank you for reading. A well-deserved Freshly Pressed. You made me feel you, you made me want to read Didion, and recall grieving years from my parents’ deaths. I am a new follower, looking forward to more! I’m sorry for your loss (which are some of the most awkward if well meant words a person can give you at this time). I hope in 351 days this book helps you the way it helped me. I found this title in a used book store and have often marveled at the trajectory of our lives as marked by the stories that map our journey. Beautiful review of a lovely work. Thank you! My Mother is fond of the saying, “when the student is ready, the master will appear.” I think this must extend to books as well: we discover the right reads when we’re ready for them. So nicely done! Your review is a lovely tribute to to an author who has a lovely way with words. That book was so helpful, after – some time after, my big brother died. And your grief process sounds very honoring to your father and his memories. Thank you very much! I’m glad to hear Didion’s writing has helped others. I feel like I’ve been recommending it non-stop to friends and family. Reblogged this on The Blog OF Magical Thinking. Good review and taking Didion’s story to a personal level. I too felt enmeshed in her grief because I had experienced sudden death of someone I loved. “Beverley died.” I still remember my husband’s expression as he gave me the news about my sister. I screamed. Not loud enough. I remember thinking that if I could just scream and scream and scream, the pain might go away. But, “must do’s” intervened. As they did for Didion. The words changed time. Even now I think of events as “before Beverley died” or “after Beverley died” if I have to try to remember when something happened. Eighteen years later and I can still smell and taste her cheek when I kissed her. Thank you. And I’m sorry to hear about your sister. “Must do’s” are sort of a mixed blessing because they give you something to cling to in the storm. But the grief still comes in waves no matter how long after. Thank you for sharing your story and I hope remembrances of Beverly come a little easier now. Added to my book list. Good read by the way. I read it way back and don’t recall the details but remember feeling disappointed. I think I’d expected a lot. Sometimes our high expectations completely ruin a read. It’s happened to me many times. Oh, MAN. That’s a good way you highlighted that. I’d better not let my readers expect too much if/when I ever do write my book. LOL. I’m sure I’ll be guilty of the hype with this post! Some books don’t reach others in a significant way, and that’s OK too. The raging hype monster eventually attacks everyone. I too have had a loss very close to my heart, and although it has been almost 6 years already, I remember it all like yesterday. Thank you for your well written words, you have intrigued me to put this book on my winter reading list. I’m sorry for your loss, Tracie. Time helps with perspective but the pain never really goes away; we just get better at handling it. I hope this book helps in some small way. Geez. That sounds like a potent piece. I’ve heard of this author before but haven’t read anything. I might just put it on my list. Thanks for offering a thoughtful review. Thank you! And if you get around to reading it, you’ll have to tell me what you think! For sure. And I look forward to reading more of your writing too. A beautifully written review and response to this small but very powerful book. The sharing of the loss of your own father provided a very personal and touching perspective for your readers. I think I just might reread her book again. I look forward to reading much more on your blog. Thank you very much, Mary. I hope you enjoy this book the second time around. And I hope you enjoy reading more here! This was the first Didion book I read too and she has easily become one of my favorite authors. Loved your review 🙂 Great work! Thank you! Any recommendations for reading her again in the future? Since she’s a favorite of yours and all. Thank you! I may need some time before I can reread this one, but I’m glad to hear it’s just as powerful the second time around. nice and great informatiion shearing with us . I’m sorry for your loss. I will be praying for you. Thank you for your kindness and for reading. You’re welcome. If you ever need someone to talk to I’m a good listener and will be here if you need me. I have been through it also. Then I am also sorry to hear of your loss. Connecting with others here has been a blessing. In some small way it helps to know that none of us are alone. Thank you. I agree. I believe we are all here to support each other. Getting our feelings out by writing is also very healing. It will help if you have a strong support group. I gotta go to sleep. I went into anaphylactic shock last night and feel like I’ve been run over by a train. I followed your blog and will be here if you need to talk. Well rest up and feel better!